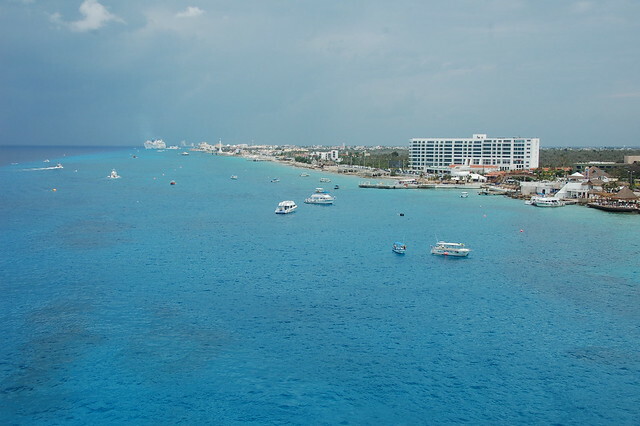 Cozumel from the boat | Flickr - Photo Sharing! After our scuba dive, we went back to the boat to have a nice lunch on the boat. What a beautiful picture. We are taking this cruise in July..any reccommendations? Would you still do the excursions or would you just tour the island? In Cozumel, my wife and I did the scuba diving (no certification needed) excursion (about $80 per person), it was really nice. It took less than 2 hours and then we went back to the boat for a nice free lunch (when I took this pic). Then we headed back out, got a taxi cab on our own (about $12 each way I think) and headed out to Chankanaab national park where we lounged on a nice beach and rented snorkel gear ($9). I think if I did it again, I'd do the exact same thing--it was a good day. Our parents did a museum tour excursion, and it didn't sound like it was really that great or much of a value. They probably should have just taken a cab to Chackanaab also and done some of the same things on their own. In Progresso (if you go there) we did the Chichen Itza tour. I'm not much of an ancient history buff. It was ok, but I wouldn't do it again I don't think. It was a 2.5 hour bus ride and it only left about 2 hours for the tour of the ruins which I'm sure would be very hot in July. Our parents liked it better than we did, so I wouldn't say you should avoid it, it just wasn't for me. I forget how much that excursion cost, but it was around $75 I think. We had a great cruise and I hope you do too! Feel free to ask any more questions you might have.